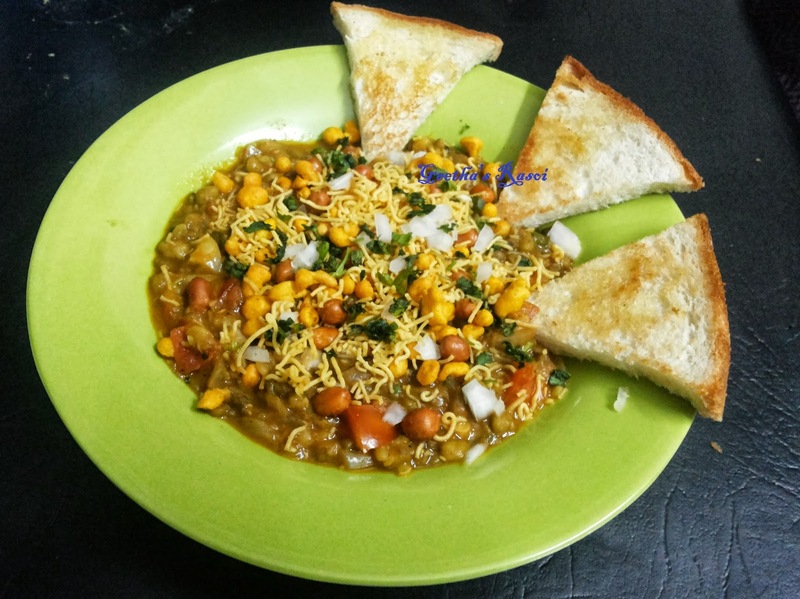 This is generally prepared with sprouted pulses, here I have used Moong(Green gram). Pav is a type of bread available in Goa and Maharastra. We can use our normal bread instead of Pav. Pressure cook moong for 3 whistles. Drain extra water and keep aside. Heat oil in a pan add 1 chopped onion and fry till light pink then add chopped ginger, garlic, green chilly and grated coconut fry till coconut turn into brown. Then make fine paste of this. Heat oil in another pan put mustard seed and hing fry for a min. Then add chopped onion when it turn light brown add turmeric powder, chilly powder, garam masala, coriander powder, jeera powder and salt fry for 2 min, then add chopped tomatoes fry for 3 to 4 min then add coconut paste and cooked moong. Add little chopped coriander leaves. Method to serve this..pour curry in a bowl add mixture, sev etc, then garnish with chopped onion and curry leaves. Eat this with roasted bread or pav bun.